Jargon busting at it’s best! Have you found yourself scratching your head over some of the terminology used in the washing machine spec? Don’t worry; we’re on hand to make to make sense of it all with our handy A-Z Washing Machine jargon buster so you’ll be speaking the lingo in no time. Anti Crease Programme – Washing machines with an Anti-Crease program will perform additional spins at the end of the cycle to gently untangle clothes. This will reduce creases and make ironing easier quicker and easier. 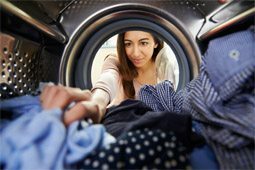 Audible End of Programme – When the washing machine has finished the cycle it will make a sound to alert you that your wash load is ready to unload. This can be turned off if you wish. Automatic Dosing – Washing machines with auto-dosing calculate how much detergent is required to wash your clothes and adds it to your wash automatically. This is from a pre-filled compartment located within the washing machine which on many machines can hold up to three months worth of detergent. Anti-Vibration Technology – Some washing machines are built with anti-vibration technology which makes them more stable and super quiet – Great for flat/apartment living. Anti-Allergy – Some washing machine have specialist programs to help eliminate allergens, bacteria and dust mites. Ideal for those with sensitive skin, anti-allergy washing machines use a hotter rinse than other machines giving your clothes a deeper more hygienic clean. Appliance City Tip – Look out for the seal of approval from The British Allergy Foundation. Add a Garment – The ‘add a garment’ feature from Fisher & Paykel allows you to quickly add or remove a garment mid cycle – so if you’ve missed a pesky sock on the stairs you can pop it in no problem. Loading – Refers to the position of the door where you load you laundry into the washing machine. The majority of washing machines in the UK are frontloading. Load Detection – Some washing machines have innovative Load Detection technology which can automatically calculate the cycle time, rinsing time and water consumption to best wash your clothes. Using this feature can save you time and money on your energy bills. Kilogram (kg) – A washing machine capacity is measure in kilos.1 kg is toughly 1 outfit which includes 1 pair of adult trousers, a shirt, underwear plus a pair of socks. Read more about washing machine capacity here. Jeans/Denim – Some washing machines have specialist wash programs tailored to wash denim items. Integrated – Designed to be hidden from view, built-in washing machines are fitted behind your existing cupboard doors and create a seamless look within the kitchen. Inverter Motor – Also known as a brushless motor, washing machines with Invertor Motors are designed to be quieter and more reliable than regular motors. Intensive Wash – Some washing machines come with an intensive wash program which is designed to give a more thorough wash to heavily soiled clothes. Intelligent Wash System – Some washing machines have intelligent sensors within the drum which detect the size of the load and alter the amount of water and cycle time needed. There are some sensors that can detect how soiled a load is too and cleverly adjust the amount of water, detergent and energy is needed. Hot-Fill/Mix-Fill – There are select few washing machine manufactures that offer the option to connect your machine to a hot water supply. Hot-Fill/Mix-Fill washing machines so water are heated using your boiler as opposed to within the washing machine. Hand Wash – Clothing which displays a Hand Wash symbol on the care label need a little extra care attention. Washing machines which have a Hand Wash program are extremely gentle and take the hassle out of manually hand-washing. Half Load Function – Washing machines with a half load function adjusts the amount of water and energy used when washing smaller loads. Appliance City Tip – Waiting until you have a full load will always be the most economical way of doing your laundry. Honeycomb Drum – Miele’s sculptured honeycomb drum creates a thin film of water which cushions your clothing during the wash cycle. This gives them added protection from any damaging effects from spinning. Garment – A garment is another term for an item of clothing. Fuzzy Logic – Washing machines with Fuzzy Logic feature intelligent technology which calculate how much dirt is in the load and automatically alters the amount of detergent, water and energy used during the cycle to guarantee the best possible results. Energy Consumption – The estimated amount of electricity used by a washing machine during a wash cycle or can be calculated using average usage over a whole year. Energy Rating – This rating tells you the energy efficiency of the washing machine. The highest rating currently is A+++. Washing Machines with a higher rating are more environmentally friendly and will cost less money to run. Learn more about Energy Ratings here. Energy Saving Recommended – A washing machine which has been recommended by the Energy Saving Trust and is recognised for being more efficient within the environment. Extra Rinse – Washing machines with an extra rinse function provides an additional rinse or several extra rinses to the end of the wash program. These extra rinses are useful for removing stubborn stains and washing out the remaining traces of detergent – ideal for those with sensitive skin. Eco Bubble – Ecobubble™ technology from Samsung allows you to use cool water as effectively as warm, saving you energy. It’s gentle on your clothes and on the environment. Capacity – The capacity of a washing machine is measured in kilograms and this figure tells you know how many dry clothes can fit into the drum. More often than not, the cotton washing programs are the ones that can hold the machines maximum capacity, while other specialist programs work best with a reduced wash load. Child Safety Lock – With this feature the washing machine will not be able to be opened when a cycle is in progress or even if it’s empty. Also, additional safety features include the locking of the control panel so the buttons cannot be pressed and preferred settings altered. Care Labels – These are the labels you find on the inside of your clothes, which tell you how best to wash each item. For more information on what the symbols mean, take a look at our washing symbols guide. Control Panel – The control panel is the section along the top of the washing machine which features all the control dials, buttons and displays. Cold Fill – The vast majority of washing machines available in the UK are cold-fill models. This means that you connect the machine to a cold water valve, and the water is heated inside the machine. Cycle Time – The estimated length of time a particular wash cycle or program will take. Baby Care – Some washing machines have a specialist Baby Care program which is designed for delicate items such as baby clothes, blankets and soft toys. This intensive but gentle type of wash cycle is often followed by a series of rinses to ensure as much detergent is removed from the wash load, giving them a more superior clean. Bedding – Some washing machines have a dedicated wash cycle for washing large items such as bed sheets. Built in – Designed to be hidden from view, built-in washing machines are fitted behind your existing cupboard doors and create a seamless look within the kitchen. Maximum Load – The maximum load or load capacity refers to the maximum amount of laundry you can wash at any one time. In most cases it is the cotton wash program which allows you to fill the drum to maximum capacity, whilst other specialist cycles such as delicates, will recommend a wash load of a lot less. Appliance City Tip – An average household would require a 7-8kg washing machine. Read more about Washing Machine Capacities here. Memory Function – Some washing machines have a handy memory function which allows you to save your favourite wash programs and settings. This is a great time saving feature. Mixed Load/Fabrics – A mixed load wash program is designed to wash different materials at the same time. For example a wash load featuring cotton, linen and synthetics. Noise Level (dB) – Sound is measured decibels, dB. The noise of a washing machine can vary from model to model and different noise levels are given for both the wash and spin cycles. Appliance City Tip – The lower decibel figure the better. Check the EU Energy Label to find out how loud or quiet the appliance is during the different cycles. Anything under 60dB shouldn’t disturb you during the wash cycle and lower than 70 dB is recommended. Learn More about Noise Levels here. Overflow/Leak Prevention System – Many washing machines are manufactured with an overflow/leak protection system, this means if a leak is detected it will automatically cut off the water supply. Outdoor – Some washing machines have a dedicated wash cycle for washing water-repellent clothing and outdoor wear. Pause Function – Some washing machines allow you to pause the wash cycle once it has started and open the door. This is a handy feature if you’ve just spotted a sock on the stairs or just remembered something in the pocket of your jeans. Appliance City Tip – Check all the pockets of your laundry before loading to prevent any damage to your clothes or washing machine. Pre-Wash – Some washing machines has a pre-wash function which is designed to rinse and lightly wash clothes before the main cycle begins. Appliance City Tip – Use the pre-wash feature for heavily stained or soiled clothing to ensure you clothes come out clean after the main cycle. Porthole – A porthole on a washing machine is the entrance to where you load your laundry from. Quick Wash – Some washing machines have a quick wash cycle which can complete a full wash in less time. Some quick wash cycles can be completed in as little as 12 minutes and save you time and money on your energy bills. Find out more about wash programs here. Rinse – The rinse part of a wash cycle removes the detergent from your clothes. Rinse Hold – A handy feature that allows you to delay the final rinse until a more convenient time to suit you. Spin – The spin is the final part of a wash cycle where the water is extracted from the clothes by the drum spinning at a faster pace. Spin Performance – All washing machines are given a spin performance rating to show how efficient the machine is in extracting water from your clothes. Read more about washing machine efficiency here. Spin Speed – This is the speed at which the drum inside the washing machine will spin during the cycle. Spin speeds are measured in RPM (revolutions per minute) and the higher the spin speed the faster the drum will spin meaning more water can be extracted from your laundry. Many washing machines have a spin speed between 1200 -1600 RPM. Read more about Spin Speeds here. Sportswear– Some washing machines have specialist wash programs tailored for washing sportswear. Some machines even have dedicated wash cycles for washing trainers. Stacking Kit – A stacking kit allows you to safely stack your washing machine and tumble dryer on top of each other and is an ideal for solution for saving room in your kitchen or utility room. The stacking kit is a simple piece of equipment which evenly distributes the weight of the tumble dryer to relive pressure and prevent any damage to your washing machine. Appliance City Tip – We’d recommend only using a stacking kit with appliances from the same manufacturer and of course the washing machine is always the appliance on the bottom. Steam Refresh – Washing machines with steam technology have a range of programs to give your clothes a deeper clean. The Steam Refresh cycle isn’t classed as an actual wash but is ideal for giving your clothes a quick refresh when they aren’t quite dirty. Whether it’s a shirt you wore the other day or a dress you’ve worn in a while, this steam only program will have them rejuvenated in no time and will help eliminate any creases. Semi-Integrated – Semi integrated washing machines are similar to built-in models however instead of the whole machine being hidden by a cupboard door the control panel is on show. Self-Diagnosis – Some washing machines have intelligent technology whereby you can self assess what is wrong with your washing machine if it displays a fault. Instead of using the manual you can diagnose the problem by using an app on a Smartphone. Not only does it find the problem it will also give you a step by step guide on how to fix the issue. Soil Level – Soil level refers to how dirty your laundry is. Top Loading/Top Loader – With a top-loading washing machine, the drum is accessed from the top of the machine rather than from the front like the majority of washers in the UK. 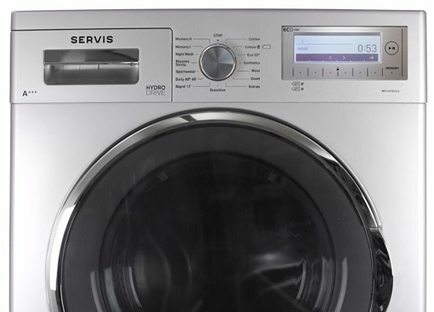 Timer Delay – Many washing machines have a handy feature which allows you to pre-load your laundry into the drum but delay the time the cycle starts. Time to End Cycle – Some washing machines have a display area on the control panel which can let you know the progress and estimated length of time until the program has finished. Transit Bar – The Transit Bar is a large metal bar that secures the drum when the washing machine is being transported. If you have bought a new washing machine, make sure you remove the transit bar before using the machine. Appliance City Tip – Be sure to keep the Transit Bar somewhere safe as it will be needed if you move home and take your appliance with you. Transit Bolts – Transit Bolts are large bolts that along with the Transit Bar help secure the drum of the washing machine when it’s being transported. Appliance City Tip – Remember to remove the Transit Bolts before using your washing machine and keep them somewhere safe, as they may be needed in the future if you move home. Twin-Dos – TwinDos from Miele is a two-phase system which automatically dispenses your choice of Miele detergents and fabric conditioner to give your clothes the best cleaning results and care. It is able to store up to three months worth of detergent for maximum convenience. Unbalanced Load – An unbalanced load can be a common problem and usually occurs when washing lots of smaller items with one bulky item such as a towel. As the clothes begin the cycle the larger item will become heavier as it absorbs the water causing the machine to become unbalanced. Many modern washing machines have special balancing technology which ensures laundry is evenly distributed around the drum or it will automatically select the correct spin speed to avoid any damage. Appliance City Tip – When washing a heavy garment such as a towel or dressing gown, try to make sure you wash it with other bulky items to balance out the load. Wash Load (Kg) – Wash load refers to the amount of laundry that can be washed during any one cycle. Wash Performance – Washing machines are awarded a wash performance rating to indicate how effectively it cleans during a cycle. Water Consumption – Water Consumption is the average amount of water used by a washing machine during a cycle. Wide Opening Door – Some washing machines have a door that opens wider than average machines making it easier to access. Appliance City Tip – Look out for washing machines with wider opening doors if you frequently wash a lot of bulkier items such as bedding and towels. Wool Program – A wash program provides a gentle wash for woollen items. The temperature for this cycle is typically 40°C or colder and has a much slower spin speed to ensure the garments aren’t stretched. Warranty – There are two main types of warranty available for washing machines. The first on being the manufacturer’s warranty, this is typically one or two years and comes with the washing machine as standard. You can then choose to extend your warranty up to a maximum of five years and in most cases extended warranties have an additional charge. Some washing machine manufactures offer a ten year warranty however this is on the motor only. Water Supply Hose – This is the hose between the water feed and the inlet valve on the washing machine. Waste Hose – This is the hose that transports the used water from the washing machine to a drain/waste pipe in your home – typically this is the one located under your sink. Water Inlet Valve – This is the valve at the rear of the washing machine where the water enters. Variable Spin – Washing machines with a variable spin speed feature allow you to manually adjust the spin speed of a cycle. You can choose a lower spin speed to reduce creasing or a faster spin to speed up the drying process. Variable Temperature – Many washing machines allow you to manually adjust the temperature of a cycle to suit your requirements. Appliance City Tip – Washing at a lower temperature will save more energy. VarioPerfect – VarioPerfect from Bosch allows you to tailor your wash programs to suit you. Choose SpeedPerfect to reduce wash time by up to 65% or opt for EcoPerfect to save energy by up to 50%. Vortex Wash – Vortex Wash from Fisher & Paykel speeds up the cleaning process by making most cycles less than an hour to complete when washing at 30˚C. Described as “an explosion” It quite simply uses the force of the spinning drum to deliver the soapy water deep into the fabric surface to get the clothes clean quicker. Top Tips: 3 things to do when first unpacking your new washing machine! Picture this, your shiny new washing machine has arrived in your home, you’ve got laundry that needs washing for tomorrow and you’re raring to get started but what do you need to do before you load it and turn it on? Follow our mini checklist to make sure you’ve got everything sorted before your first wash load. 1. Remove the Transit Bolts and/or Transit Bar – When your new washing machine arrives it will need a few things removing before you can use it. Manufactures fit washing machines with a transit bar and bolts to help secure and support the drum whilst it’s being transported. They are easily removed with household tools but can be detrimental if left on. Remember! Make sure you keep the transit bar/bolts in a safe place; you may need them in the future if you move home. 2. Plumb it in and put it in place – Plumbing in your new washing machine is relatively straight forward and no specialist knowledge or tools are required. It’s just a matter of removing the transit packaging as mentioned above, screwing on the fill hose(s) and connecting the drain hose to the waste water system. If you feel uncomfortable installing your washing machine, please seek professional help by calling your local plumber. 3. Register it for Warranty – Every washing machine will come with at least a 1 year manufacturer’s warranty but this is only valid once you register your appliance. The warranty information can be found with the instruction manual and paperwork and more often than not there are several ways to register e.g. by post, by telephone or online. The information needed may vary but in most cases you will need to have your washing machine’s model number, serial number and the date you purchased, along with some personal information such as your name and address. 88% of the washing machines we sell are A+++ rated. Now that’s efficient! Help Me: Where is the Serial Number/Rating Plate on my Washing Machine? Although all washing machines are different most manufactures place the rating plate in a similar place. Be sure to look in these 4 places to locate your washing machine’s credentials. These include the model number and serial number which are often needed to register your new appliance for its manufacturer’s warranty. 1. Behind the Door – This is the most common place to find your serial number. Check all the way around the door and near the hinge or even on the inside of the door itself. 2. Behind the Kickplate – Another place to check for your serial number is behind the kickplate, this is located at the front of the washing machine underneath the door. Do take care when removing this, as kick strips are often made of thinner materials. 3. Behind the Filter Door – If your washing machine has a filter fitted and you can’t find your serial number on the above then try behind the filter door. 4. The Back & Sides – If you’ve tried all of the above, your serial number/rating plate may be located at the back of the machine, we’d recommend checking the sides too! There are washing machines in the market to help people with allergies! 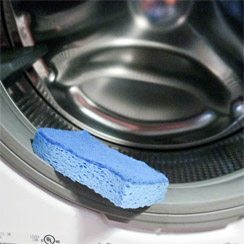 How to: Spring Clean Your Washing Machine! A washing machine is a big purchase and although you’d think it ‘cleans’ itself, washing machines still need some TLC every now and then. Keep your washing machine in tip top condition by following our 3 easy steps for a fresh and clean spring cleaned machine! 1. Let’s start at the top, the detergent drawer can be home to all sorts of gunk, and grime and eventually it build up inside the drawer and be pretty unsightly as well as unhygienic. A simple solution is to remove the drawer completely and give it a soak in some hot soapy water and then give it a scrub if needed. 2. Mainly the reason for a smelly washing machine, the rubber door seals are often the place where bacteria, mould and unpleasant odours occur. To prevent this happening make sure you give it a regular wipe down using a simple water and vinegar solution. * Be sure to get stuck in to all the folds and crevices and if you can, leave it to dry before shutting the door. * One part vinegar and 10 parts water. Don’t forget your marigolds! 3. For a quick spring clean try putting your washing machine on its hottest cycle but without any clothes inside. This hot wash will flush any bacteria away and give your washer a burst of freshness. For an even deeper clean, add a cup of white vinegar into the drum and run a hot program, this helps combat any odours! As mentioned before, leave the door open until the drum is fully dry, this allows it to breathe and bacteria less likely to breed in dry conditions.